and has no official affiliation with the Pearland Independent School District or its coaches. Proceeds raised by each host location during the tournament will go to help selected local families dealing with cancer. Each campus will select their own recipients and run their own fundraisers, so activities at each location may be different. As part of the fundraising efforts at Pearland HS, we are selling t-shirts and conducting a raffle during the tournament, with prizes donated by area businesses and our own softball families. Cash donations are also accepted. We appreciate any and all support from the fans and families attending the tournament. In addition, Pearland HS will set aside funds for one $500 scholarship. The 2019 Haynie Spirit-Patti Powell Memorial scholarship will be awarded to a senior that plays in the Pearland High School pool of the Haynie Spirit Tournament. Scholarship applications will go out in March to eligible students, and the scholarship will be awarded in May. We invite everyone to attend Pearland's final game of the tournament on Saturday at Pearland High School. Before this game, we will be presenting a check for the proceeds raised during the tournament for the chosen recipient. Please note that there is a gate fee for the tournament, but the money collected is used only to subsidize the cost of the umpires. Any remaining umpire costs are paid by the Booster Clubs. If there are any excess funds collected, they will go into the proceeds for donations. 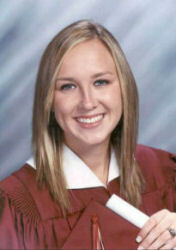 About 'Haynie': Jennifer Haynie was a 2007 Pearland High School graduate and a Lady Oiler softball player. She also played on several softball teams around the Houston area. During her senior year of high school, not long before prom, she was diagnosed with Osteosarcoma. In March of 2008, PHS Softball hosted our first ever Strike Out Cancer night, and Jennifer was our guest of honor and threw out the first pitch. Just two short months later, on May 18, 2008, Jennifer lost her courageous year-long battle with cancer. Upon her death, we decided to name our new annual tournament in her memory, and use the Haynie Spirit Strike Out Cancer Tournament to raise money to help other softball families dealing with cancer, or support the search for a cure for Osteosarcoma through the Haynie Spirit Bone Cancer Foundation (www.hayniespirit.org). 1976 graduate from PHS. She was active in PHS athletics and had a love for sports. Patti and her husband Steve had three children who graduated from PHS. Youngest daughter Krissa played on the PHS Softball team and graduated in 2012. In August 2011, Patti was diagnosed with Renal Cell Carcinoma Sarcomatoid, a very rare and aggressive kidney cancer. In 2012, a $500 scholarship was established to honor Patti. The Haynie Spirit-Patti Powell Memorial Scholarship will be awarded to a senior that plays in the Pearland HS pool of the Haynie Spirit Tournament each year. 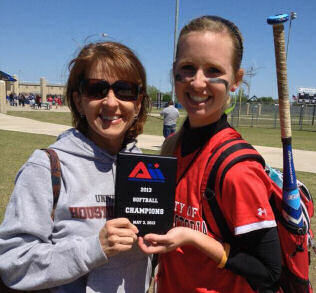 Krissa went on to play softball at the collegiate level at UH Victoria, and Patti was there to cheer her on her first season. After a valiant fight, Patti lost her battle with cancer on November 1, 2013. Patti’s message: It is because of my strong faith in God that I am able to sustain a positive attitude and an intense passion for life. Steve and I wish to extend our deepest gratitude to all our softball kids, softball family and coaches for their continued love, support and prayers. Copyright © 2007-18 PHSSBC. All rights reserved.